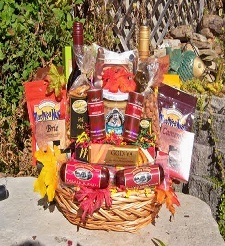 Here is a great gift for the wine lover in your life. Incluces two bottles of Missouri wine/ red and white. Cheese, crackers, pretzels, dipping mustard, sausage, nuts, milk and dark chocolate.